Sometimes when Doocy and Kilmeade stay home to play with their Legos, Fox News calls up minor-league hosts to man Fox & Friends, and though that doesn’t sound like a decision fraught with much peril, it almost had disastrous consequences last weekend. As Mediaite reports, West Point’s band the Hellcats were on set playing the show in and out of commercial breaks last Saturday. 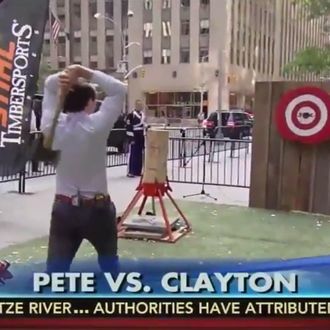 Before one such break, co-host Pete Hegseth, a former military man and current Iran war booster, chucked an axe at a wooden target and missed entirely. But where did the axe land? The camera didn’t show. All viewers saw were two drummers drumming and a third clutching his arm in pain. Now the drummer in question, Jeff Prosperie, has provided video proof of what happened on the other side of the target, and, damn, does it look painful. My leadership told me they were told there would be no axe throwing. I think the anchor person went rogue and decided to throw it. He had only thrown it once before in practice for an upcoming segment and they told him to throw it with more force. The vid you see is edited showing the Televised portion of the throw and then edited to a portion that was taken on someone’s phone of us being videoed. The part that was actually televised showed the overthrown axe and then segued to us for the drum solo bump, only showing me walking behind the section holding my arm. The actual part where the axe hit me was not televised. Poor decision, obvious negligence, should not have happened, could have been avoided.